In economically uncertain times, it makes sense to look to growth industries if you want job security. According to U.S. News and World Report, it is predicted that tech jobs will grow faster than the average for all jobs at a rate of 12 percent this decade. With tech skills in such demand, jobs in this sector offer above average pay and unemployment rates are very low. If that all sounds good to you, the next question is where to begin to capture a top spot in tech. What are top tech companies looking for in the way of talent? How can you choose which tech path to take? And how can you maximize your chances of getting the tech job of your dreams at the salary you want? When you take these factors into consideration, you may be able to narrow your tech choices down a bit. Doing some online research and personal networking with others interested in the technology sector may also yield actionable information about which path to choose. Your earnings potential varies according to which tech path you take. For instance, take a look at these salary comparisons, based on data compiled by Paysa for top tech jobs. Data Analyst: The average market salary for data analysts is $91K per year, ranging from $63.1K to $121K. Average market salary includes $74.9K base salary, $12.7K annual bonus, $8.04K signing bonus and $18.1K annual equity. The majority of data analysts have a bachelor’s degree. Top companies for data analysts include Cisco Systems, IBM, and Apple. Software Developer: The average market salary for software developers is $93.7K per year, ranging from $66.2K to $123K. Average market salary includes $80.5K base salary, $13.3K annual bonus, $7.34K signing bonus and $18.9K annual equity. Most software developers have a bachelor’s degree. Top companies for software developers are Epic!, IBM, Microsoft, and Amazon. Software Engineer: Software engineers also typically need a bachelor’s degree. The average market salary for software engineers is $118K per year, ranging from $72.1K to $168K. Average market salary includes $92.8K base salary, $17.6K annual bonus, $9.39K signing bonus and $28.6K annual equity. Top companies for software engineers include Google, IBM, Cisco Systems, and Microsoft. Product Manager: The average market salary for product managers is $133K per year, ranging from $86.3K to $185K. Average market salary includes $106K base salary, $16.5K annual bonus, $10K signing bonus and $28.8K annual equity. Most product managers have a bachelor’s degree. Top companies for product managers are Google, Cisco Systems, Microsoft, and IBM. There are many different ways to rank top tech companies. 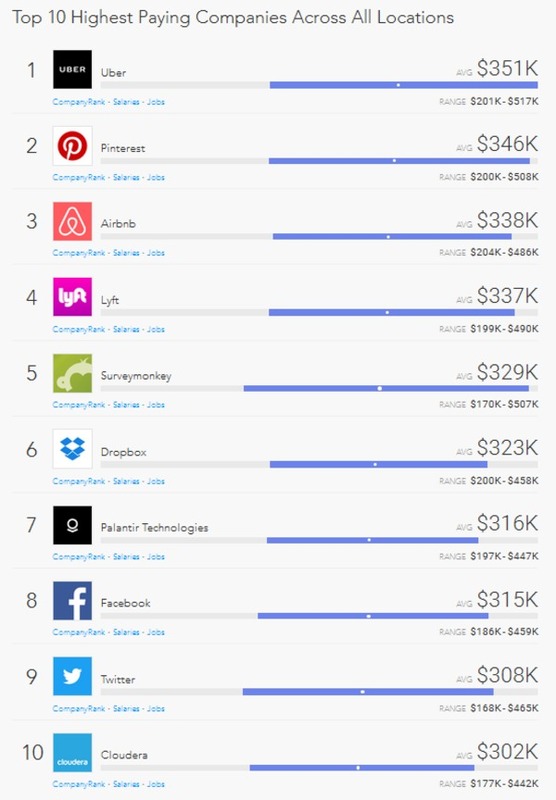 Popular ways of ranking top tech companies include ranking according to salary or perks offered. You, of course, must decide what criteria are most important to you. On the other hand, Salesforce puts a premium on other skills, with 46 percent knowing cloud computing and 39 percent being proficient in agile development. Facebook, meanwhile, prefers candidates with knowledge in multiple programming languages. 46 percent of Facebook employees know Java, and 44 percent know Python. Facebook also values skill in C++, distributed systems, algorithms, and machine learning. It is interesting to note also that 42 percent of Facebook’s employees hold master’s degrees. Rather than providing just a static dataset, Paysa offers a personalized experience for you. Based on information you provide regarding your education, skill set, and current tech position, Paysa compares where you are with tens of millions of tech career paths, salary data points, and options. Then, Paysa provides personalized recommendations regarding new skills to pursue, salary negotiations, and potential career advancement opportunities. Put the power of Paysa in your hands by taking just a moment to sign up to personalize Paysa for you. I feel like I sat with a recruiter after reading this article. Thank you so much for putting so much detail on this research to make it “personal”.